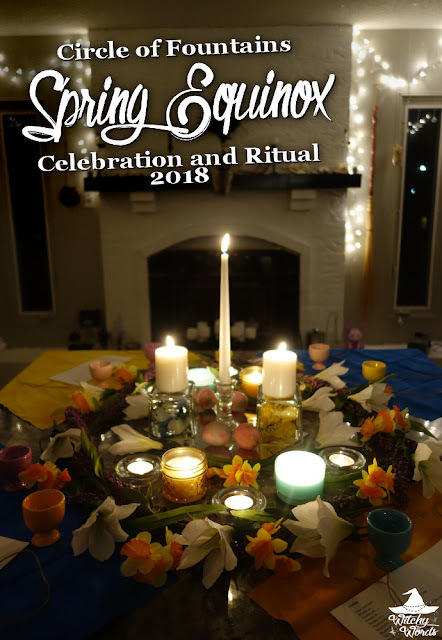 This post will cover the Spring Equinox / Ostara ritual and celebration held by Circle of Fountains. To see the Circle of Fountains 2017 Spring Equinox ritual, click here! This year's ritual was written and led by Andrea! Each Circle of Fountains Primary Member writes and leads a different sabbat ritual every year, giving the coven a chance to experience a variety of paths. Andrea is an Egyptian Polytheist who utilizes her beliefs to form a deeper understanding of the Self. She honors Bastet, a feline warrior goddess, and Seth, a god of storms, desert and disorder. In the past, she's explained her path in depth in an article you can find here. 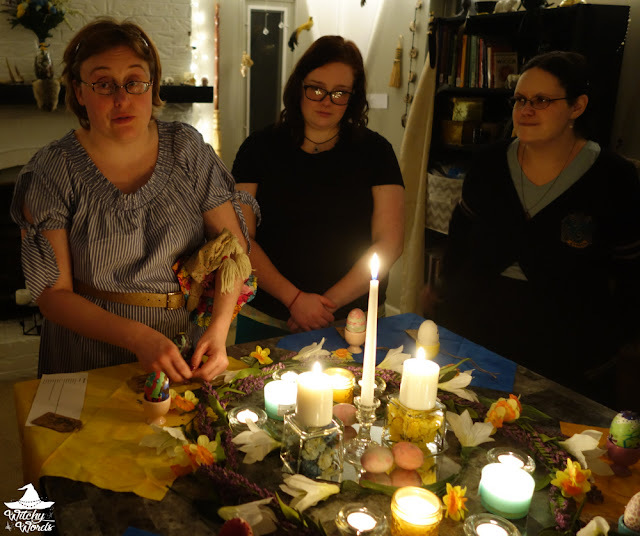 "My inspiration for Ostara ritual was communication," Andrea states. "The reason behind this topic was due to listening to my circlemates and some of the issues that they were having. I wanted to help them work through it." You'll actually get to learn even more about Andrea's process behind the ritual in her upcoming guest article to be posted at the end of March! As always, our celebration began with a craft! We began by painting hollow wooden eggs in any decoration we wanted. We then filled them with herbs for communication, like fennel, chamomile and lavender. We also placed a stone for communication. Stones included amethyst, sodalite and quartz, just to name a few. Finally, we wrote a statement about enhancing communication on a piece of blue or yellow paper - common colors for communication - and placed that inside before sealing it shut either with paint or hot glue. Andrea also made gorgeous tags for us to write the contents and purpose of the eggs on. Afterward, we feasted on our equinox potluck, which included dishes like a roast with carrots and potatoes, bacon-wrapped asparagus, garlic butter bread, raw veggies, a pavlova, cupcakes, hard boiled eggs and a peach moscato! After dinner, we entered the ritual room! Andrea went to great lengths to provide an elegant spring setting as the background for her ritual. We began by placing our decorated wooden eggs in egg cups, adding them to an already gorgeous altar. We then opened the circle by calling the quarters, beginning in the east and working clockwise around the room. As a special addition, Artie was asked to assist with quarter-calling. He loved it! Before ritual, Andrea asked me and Phaedra if we'd assist in leading the group in a couple short meditations. So, after the quarters were called, Phaedra led us in an opening meditation. This one asked us to picture a blockage in our path towards better communication. We then removed that blockage to continue towards our destination. As we opened our eyes from the meditation, Andrea spoke about the astrology behind this year's equinox. Jupiter moving into its own sign in Sagittarius means that you might have to look inward for rewards. With Pluto aggravating planets of communication and love but matching with Jupiter and Uranus, it's a good time to release something that's holding you back. The combination led her to this sabbat's working: Removing a blockage in communication. We then went clockwise around the circle, letting each covenmate talk about the kind of communication they'd like to work on. Some chose physical world communication as they wanted to be more open about their internal feelings with friends and family. Others chose a more spiritual outlook, asking to remove blockages between them and spirits or deities. Still others even looked inwards, asking to be kinder with the words they use towards themselves. As we explained our eggs, we used a piece of twine to tie the tags around the base of our egg cups. In addition to the eggs, Andrea gave us a planter and seeds to herbs and plants that represented the theme of the evening. Developing better communication techniques will take time, effort and patience. As such, she asked us to plant a seed of communication and nurture it to grow over time as a natural and living representation of the egg. With that, I read the closing meditation. This time, when everyone visualize the pathway to their goal, no blockage hindered their way. I asked them for patience as they continued to travel back and forth across that path. From time to time, road blocks pop up. All you have to do is slow down, breathe and keep moving. With that, we released the quarters and closed the circle with Artie's help! From my family to yours, have a fantastic equinox! To see the previous sabbat, February Eve/Imbolc, click here! Wow! I’m always impressed with the rituals Circle of Fountains does but this time around especially so. The eggs are a great idea, which I may use in my own upcoming solitary ritual. (I was sick on the actual equinox so haven’t done anything yet.) Thank you Marietta and everyone in the circle! Happy belated equinox and have a wonderful spring! Andrea certainly creates some amazing rituals! I'll be sure to pass on your comments to her. Thank you so much and happy belated equinox to you as well!